Chittenden County and its environs have a preponderance of women who teach singing at area schools, sing professionally or simply love to sing. They tend to end up in Bella Voce Women's Chorus of Vermont. (Among the latest is opera singer Helen Lyons, a soprano who now lives in Ferrisburgh after three years on German stages and elsewhere.) Led by the indefatigable Dawn Willis, who founded the group in 2004, Bella Voce's perfectly blended sound reflects its name, which means "beautiful voice" in Italian. The group's strong community support has helped it produce six CDs. These albums range in focus from the compositions of Gwyneth Walker to Robert DeCormier's arrangements of spirituals and folk tunes to, on the chorus' latest album, world music. Heart Songs: Music of the World brings together 19 songs in English, Spanish, Hebrew, French, Swahili and more. There's even an Iroquois soundscape with tinkling bells and drums. (All liner-note lyrics are given only in English.) Yet for all its variety, the recording maintains a through-line of heart-stopping lyricism. Clearly aware of her chorus' strength in this regard, Willis chose three songs by Canadian composer Mark Sirett. The latter's "Les Etoiles," sung in French, highlights homophonic singing and compelling harmonic interest with a simple piano line — here played by Bella Voce's able accompanist, former Burlington High School choral director Frank Whitcomb. The song has a full-bodied lushness that is particularly beautiful for being as "fleeting" as the stars of its title. For peaceful tranquility, three of the songs are unmatched. "Dirait-on" ("So They Say") comes from a song cycle by the eminent Morten Lauridsen based on poems written in French by German poet Rainer Maria Rilke. Canadian composer Eleanor Daley's "Ave Maria," published in 2001, evokes a sense of holiness reminiscent of the early Catholic Church. And "Weep No More" is New Zealand composer David N. Child's setting of a stanza from a John Keats poem. Most pieces are contemporary. The album's oldest work, Gabriel Fauré's organ-accompanied "Ave Verum" from 1894, struck this listener as slightly bloodless; its constantly resolving atonal moments seem to contradict its subject — "death's agony" for Jesus on the cross. Bella Voce occasionally break out of their lyrical mode with rhythmic songs accompanied by percussion. "Chindia" is a Romanian folk dance sung in rhythmic nonsense syllables. One of two pieces in Hebrew, the rousing opening song — "Bashana Haba'Ah" ("Next Year") — is by Israel's beloved female composer Nurit Hirsch. Written in 1970, three years after the devastating Six-Day War, it looks toward to a time when children can run and play freely. Children closer to home — and their parents — will be among those most familiar with the Vermont state song, "These Green Mountains." (Former governor Howard Dean can be thanked for that decree in 2000.) Bella Voce's phrasing and Willis' own arrangement might persuade listeners that the song should be heard more often. The group imbues it with a tinge of nostalgia that makes one grateful not only for Vermont but for the fact that the state has inspired such beautiful singing. 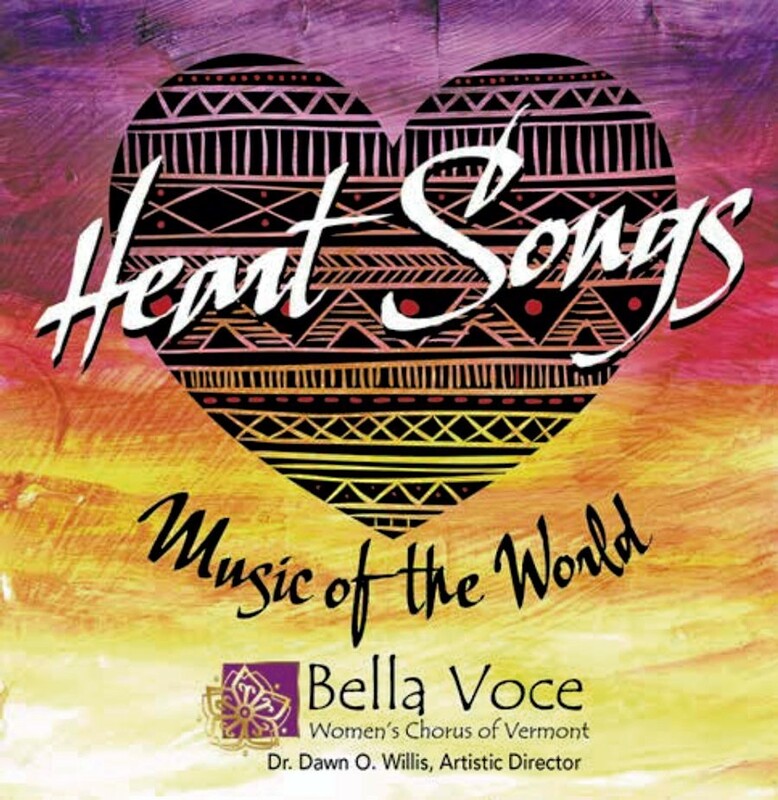 Heart Songs: Music of the World by Bella Voce is available in select local bookstores, at bellavocevt.org and for download at CD Baby.